Father Grigori Donovach tends to the nearly abandoned Church of the Sun in Little Barovia by himself. 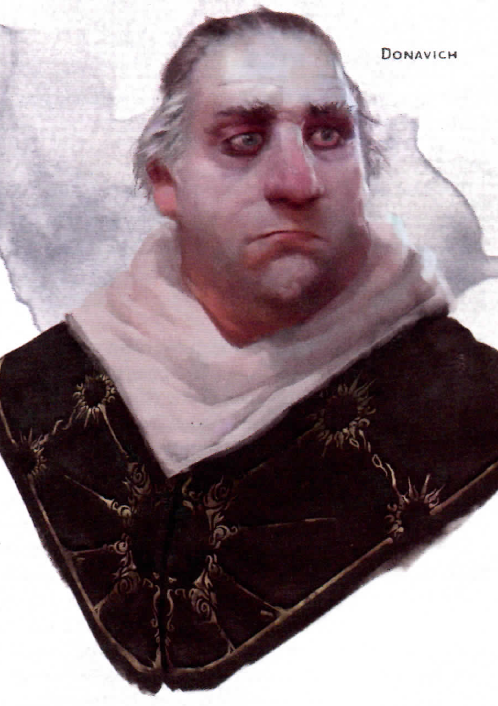 His son, Doru, was turned into a vampire spawn by Strahd von Zarovich over a year ago when the “Mad Mage” led his rebellion against Strahd. Doru has been locked in the basement of the church since. Praying for his son, fasting, chronic exhaustion, loneliness, and despair have brought him to the brink, but he has not yet given up on his son. He has asked the characters that if they ever go towards Krezk, to search out the ‘wise abbot’ in that town’s abbey.